10/8/08 Still one barrel not bottled, using for barrel tastings. Excellent quality, not overoaked. 3 years in the barrel now. On 8/18/07 we bottled barrel Q1 which was generally considered the best barrel of the 6. Barrel Q1 yielded 25 cases and 8 bottles. Barrels Q2 and SG1-3 were racked to stainless tanks in the back of a pickup truck, driven over to the new cave and pumped back into the same but cleaned barrels in the cave. On 8/19/07 the Hollers bottled half barrel CV3 which yielded 9 cases and 9 bottles. On 4/20/06 Tracy and I did an acid adjustment to all of the barrels bringing the acidity up 1 g/l from about 5.3 to 6.3 g/l. This was done in response to the low TA and high pH numbers observed in the analysis that was done. We did a tast test before and after the first barrel was adjusted and agreed that it was a substantial improvement. The wine before tasted rather flat. Afterwards it was crisper and more fruity in my perception. The acid alcohol balance was notably improved and the immunity to spoilage was also significantly improved. The free sulfur also goes up with lowered pH further improving the protection. Noteworthy is that we all thought these wines were quite good even before this adjustment so now they should be really good. This is a nice bonus. Thanks to Tracy we got some free analysis from the Rubicon Estate Winery formerly known as Niewbaum Coppola. This contribution is worth a couple hundred dollars at least and saved us a good day's analysis work. Malo Lactic Fermentation was competed although Tracy's data indicates barrel SG3 still has some malic acid in it. 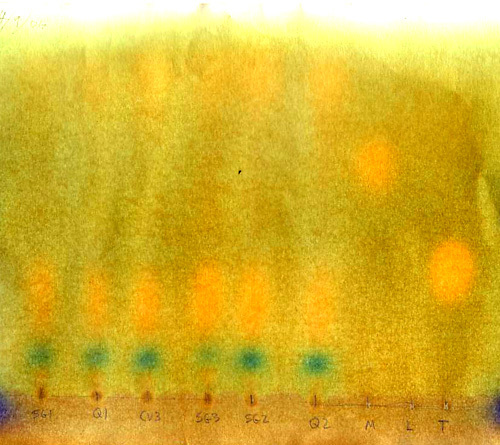 The chromatograph sort of shows a little sign of malic for SG3 but, you have to use your imagination. It could have been a bad measurement or possibly the topping wine had some Malic in it the last time the barrel was topped. 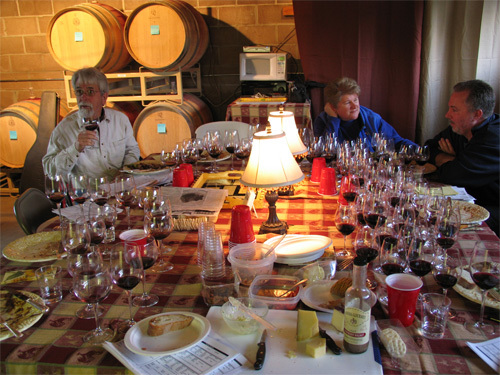 On 4/9/06 we had the first blind tasting of the 05 Napa Vintage. The results were as follows. 14 wines were tasted and fell into 6 different classes. We had a very successful racking off of the lies this last Sunday,12/18/05, in spite of the rain. 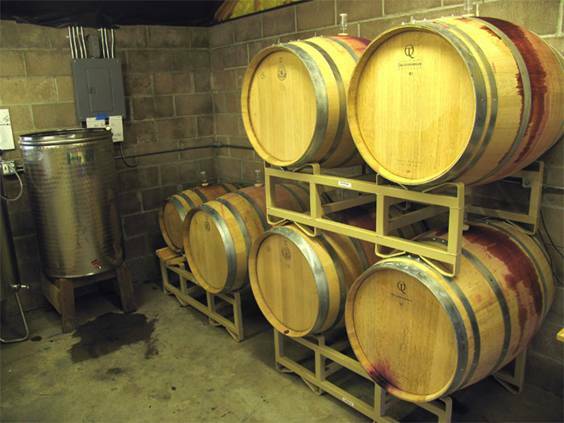 We racked 328.8 gallons of wine off of 12.5 gallons of very compact lies. The racking yield was 96.3% which is quite high. Only 4.7% of the volume was lost. The 328.8 gallons filled 5 and a half barrels and left only 2.8 gallons of topping wine. We have two French oak barrels, two American Oak barrels and one Russian Oak barrel. This is about 135 cases of wine total. It took us from 9:00am to about 1:30pm, about 33 minutes to rack and clean each barrel. Nice job. In my humble opinion the wine is tasting quite good for this point in the process however, my nose was not functioning at all. On the evening of 11/10/05 I did the Malo Lactic fermentation innoculation and addition of nutrients. I also added a small amount of tartaric to the Old vine wine in containers D, Q1 and SG2 to raise the pH a little. Target change is .2g/l taking the T.A. from 5.8 to 6.0g/l. Barrels Q1 and SG2 which contain old vine wine at 4.0pH continue to overflow a little likely due to a spontaneous Malolactic fermentation. We have had to remove 150ml a couple times and once they overflowed out of the airlocks onto the barrels. I believe the higher pH and lower alcohol of the old vine wine has made it easier for the M.L. to take place. on 11/17 Cindy was at the site and saw these barrels overflowing again as well as barrel SG1. SG1 is probably the warmest barrel near the window and the M.L. is starting to take place in it now too. T.A. and alcohol are right where they should be although I am a little confused about how we got to these numbers based on the analysis we did along the way. I think the conclusion is that it is tough to get good data while fermentation is actively going on. 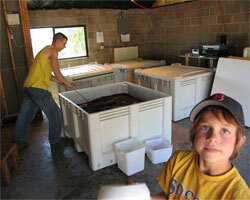 On November 5 we pressed 506 gallons of must and ended up with 341 gallons of wine for a press yield of .67. This was very close to what we expected. At right we have Rich checking the barrel filling. 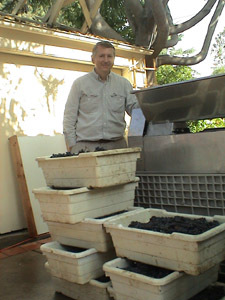 The wine migrated from the bins, through the press and then to barrels and tanks as follows. 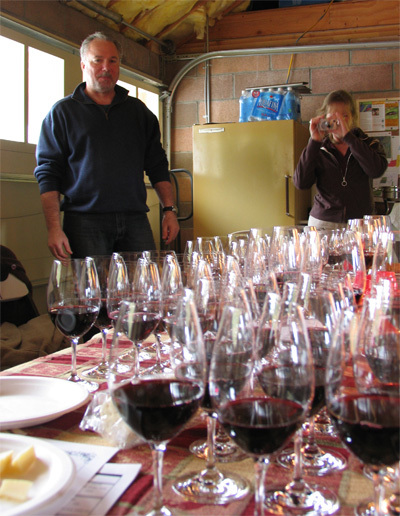 On 10/22/05 analysis was done as the wine neared completion of the fermentation. All samples were degassed for 15 minutes but, fermentation was still quite active and CO2 probably regenerated before I could measure the samples which may explain the high T.A. numbers. On 10/20/05 Rich Poliak added stage 2 yeast nutrients. Because the fermentation progressed so quickly there was no opportunity to add the stage 3 nutrients. No detriment was seen as the ferment completed all sugar conversion without production of sulfides. On 10/17 the must was moved between bins to equalize volumes as follows. Old vine and New vine must were not mixed. Also the must in bins 1 and 2 from the new vines with very high Brix of 27 was diluted by 7% to reduce the expected alcohol content to under 15%. An acid adjustment was also made to bins 1 and 2 to increase the T.A. from 3.5g/l to 5.5 g/l and to bring down the pH to a safer range. Yeast nutrients were also added at this time based on the Nitrogen analysis results from Gusmer Enterprises listed below. Bin 1 112 gal. ---> 127 gal. + 9 gal. H20 = 135 gal. Bin 2 135 gal. ---> 127 gal. + 9 gal. H20 = 135 gal. Bin 3 139 gal. ---> 118 gal. Bin 4 95 gal. ---> 118 gal. Total must volume = 506 gallons. Volumes are approximate, measured by distance up from bottom of bin figuring 8.46 gal/in based on a geometric calculation assuming the bins are square. See the back of the wine maker's notebook. The bins are not perfectly square but rather have chamfered or curved corners. Fermentation was done in the Macro Bins in the garage. The bins were all inoculated on 10/16 with Harmony Yeast from Chr. Hansen which has a couple of wild strains of yeast that have been cultured by Chr. Hansen. On October 15th we crushed 5172 lbs. of grapes, 2445 lbs of which were from 30 year old vines at 24.5 Brix and the other 2727 lbs. of which was from young vines bearing their first fruit with a much higher Brix of 27.5. This larger than expected yield from the vineyard will produce 5 1/2 barrels of wine up from our target of 3 1/2 barrels. * measured 10/16, day after crush and sulfite. This data is somewhat questionable. Bin 3 remeasured post sulfite gave a result of 7.4g/l T.A. Post ferment, 11/10, the T.A. of the old vines was 5.8 g/l It also disagrees quite a bit with the results from Gusmer below taken only one day earlier. My only conjecture is that the grapes may have begun to ferment by the time these measurements were taken and CO2 and yeast in the must influenced the results. CO2 in the wine usually increases acidity measurements though. Make 3 1/2 barrels of wine from about 3500 lbs of grapes. More if vineyard yield is higher than expected. Make some wine with very ripe fruit. We tasted and liked the wine from the 27 Brix grapes from the young French clones picked in 2004. Water back and add acid to the wine fairly aggressively in this scenario. Make one barrel this way. Use a single yeast, Harmony from Chr Hansen. 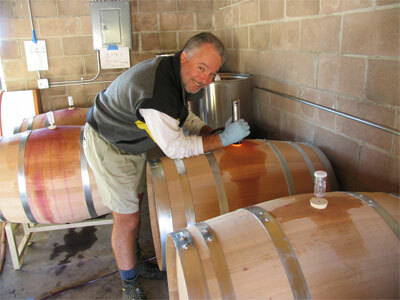 Make 2 barrels of wine in a typical way with minimal intervention to adjust alcohol and acidity. Pick at 24.5 to 25.5 Brix. Make one of these barrels with the standard Saccharomyces Cerevisiae yeast and the other with the new Harmony yeast from Chr Hansen. Harmony includes two additional strains of yeast, Kluyveromyces thermotolerans and Torulaspora delbrueckii, isolated from wild yeasts which provide more "berry fruit expression, softer tanins and prolonged mouthfeel". What to do with the extra half barrel is to be determined based on grape availability. Age this wine in the new Camalie Cave. Racking to barrels in the cave around Christmas 05.